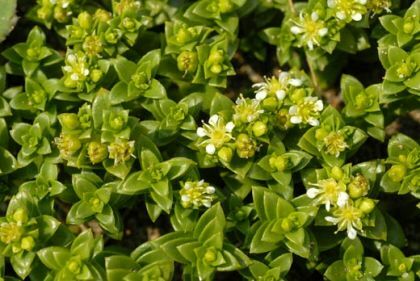 Sea Sandwort is not easily confused with other wild plants on this web site. This is a prostrate, fleshy, maritime perennial which creeps across gravely seashores and beaches, perhaps, with the help of its underground root system, helping to stabilise the eroding coastline and dunes. It is quite distinctive with its neatly arranged, yellowish pointed leaves in opposite pairs closely behind each other up the creeping stems. 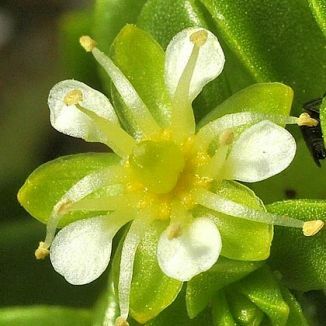 Its greenish white little 5-petalled flowers (6-8mm across) are held singly above the leaves, the petals being slightly shorter than the yellow-green sepals. They flower from May to August. The few seeds are yellow-green and globular. This is a native plant which belongs to the family Caryophyllaceae. My first record of this wildflower is in 1980 at the beach of Five-mile Point, Co Wicklow. I photographed it in 2005 at Blackhall Strand, Co Wexford. Sea Sandwort was among the first of the higher plant species to colonise Surtsey after the eruption of 1965. In the first spring after the formation of Surtsey, seeds and other plant parts were found washed up on the newly formed shore. The first of these plants to survive over winter was the sea sandwort. For further information about this plant and others which have adapted and grown on this island, see www.surtsey.is from which this information was obtained.